Airships, which are best known today for their use as advertising blimps, have long been recognized for their potential as large, low-emissions transportation vessels that can haul huge amounts of cargo into areas without the need for runways or other infrastructure. For a number of reasons -- mainly funding -- the technology has never taken off. Two congressmen, Reps. Brad Sherman (D-Calif.) and Tom Rooney (R-Fla.), are trying to change that. Last week, they announced the creation of the Cargo Airship Caucus in the House to try to boost financial support for the use of lighter-than-air vehicles for carrying military cargo and humanitarian aid. "I have followed this technology for about 10 years now," Sherman said. "I hope this new caucus can help maintain the interest that many of my colleagues have shown in the potential for airships to improve cargo transport." From the government's perspective, a new breed of zeppelins could give the military the capacity to carry large cargos faster than by ocean and without the risk of trucking it into combat zones. Because airships don't require long runways, they could be used in humanitarian catastrophes where infrastructure is wiped out, such as the 2010 Haiti earthquake. American companies have built airship technology to varying degrees. For example, Lockheed Martin has successfully built and operated its P791, a smaller-scale version of a hybrid airship. Aeros, another American manufacturer, has test-piloted a prototype of its planned Aeroscraft, which if built could fly four times faster than a cargo ship, carry twice as much cargo as a C-5 cargo plane and fly more than 5,000 miles without refueling. "Aeros applauds the Cargo Airship Caucus' creation, the expanding Congressional support for harnessing the benefits of a new flexible and cost-efficient transport modality, and support for our emergent sector in the global logistics industry," Igor Pasternak, CEO at Aeros, said in a press release. "Aeros looks forward to collaborating with other industry partners toward the quick and safe deployment of cargo airship solutions for enhanced capability in global air mobility, military logistics, disaster relief response and environmental stewardship." The caucus plans on working with all U.S. companies developing airship technology, a spokesman for Sherman's office said. Airships could have significant positive environmental impacts, Sherman said. The total emissions of an airship is 80 to 90 percent less than that of ordinary aircraft, according to researchers at the Tyndall Centre for Climate Change Research. "You can go places without roads or railroads," he said. "Airships offer a means of transport that produces less in carbon emissions than other means of moving cargo on a per-ton-carried basis, and could make it much easier to develop green energy projects." 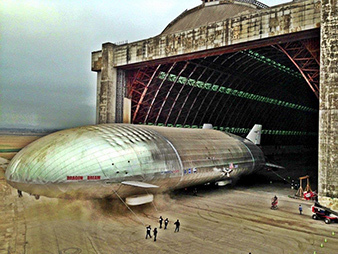 Workers pull an Aeroscraft out of its hangar in California. Photo courtesy of Worldwide Aeros Corp.
At the same time, airship technology could give companies access to resource-rich areas that were once unreachable. The fire risk also is not what it once was. Today's airships operate on helium, an inert gas, not hydrogen, which was once used and is what most people associate with airships because of the fiery crash of the German passenger airship the Hindenburg in May 1937 at the end of its 37th trans-Atlantic flight. Currently, there are no airships being flown in a cargo-carrying capacity, said Nigel Hills, a council member of the Airship Association, a nonprofit trade group formed in 1971 to promote the use of lighter-than-air vehicles. "The unrealized potential is vast," he said. "Lack of funding is a big killer." In the past, the U.S. government has pitched in money toward the development of large airships. In a 2012 report, the Government Accountability Office identified 15 aerostat and airship efforts that were underway or had been initiated since 2007 by the Department of Defense. Those efforts totaled almost $7 billion in funding between 2007 and 2012. Getting past the negative public perception associated with airships is just one hurdle. Speaking at Google's Solve for X event last year, Lockheed Martin's P791 program manager Bob Boyd said that even though his company has had the technology ready to go since 2006, it still hasn't reached mainstream acceptance. "The issue is growing the world to be ready to expect this kind of change because this is a big change," he said. "The transportation business has been the same for many centuries. We've pretty much used ships, and then we sort of moved to land modes. ... It's really difficult to add a new piece to that infrastructure, especially one that is radically different." Airships have a rich but fairly painful history, Hills said. "For a long time, airships have occupied the domain of hope, but the people who were creating them were either ahead of their time or behind their time," he said. "The reason people continue with their interest, despite lack of support, is because historically these vehicles have done some very interesting things." With the technology overshadowed by the Hindenburg disaster, what isn't often mentioned are the historical successes of airship technologies. The first airline was conducted by airship from 1909 to 1914 in Germany. During World War I, the Germans used an airship to transport 14 metric tons of supplies to their colonial army in Tanzania. The British are rumored to have used a captured German code to turn the vessel around before it could reach its destination, but the vehicle was in the air for 95 hours and covered 6,700 kilometers, "a fairly impressive feat for 1917," Hills added. By the mid-1930s, German airships were making regular passenger trips across the Atlantic. The U.S. Navy used airships for nearly 50 years to conduct long-range scouting missions in support of fleet operations and maritime reconnaissance, although not to carry cargo. There are a number of operational reasons why hundreds of airships aren't currently floating in our skies, including that airships traditionally haven't been able to deal with load exchange -- or what happens when a 50-ton load is dropped off and suddenly the lighter-than-air vehicle is much, much lighter. Both Aeros and Lockheed Martin have developed different technological workarounds to resolve that issue. Another potential challenge is the technology's potential to upset the traditional ways cargo is transported, resulting in the possible loss of employment at traditional inter-modal transfer sites, Hills said. Still, he said, he fully supports the idea of the caucus. "The concept has been proven, 70-80 years ago," he said. "But the materials have changed quite significantly, and the technology has not been proven using modern materials and modern techniques." In coming weeks, the two congressmen will begin recruiting additional members to join and are planning a meeting to highlight the recent advancements in airship development.